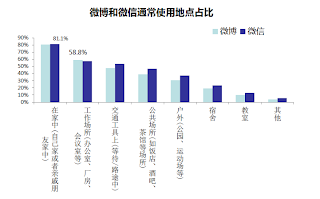 Writing about Social Media (SNS, WeChat, Weibo, LBS, Enterprise Social Networking and so on) and Mobile market/industry activity and their service in China and around Asia. WeChat and Weibo both are mainly accessed from mobile devices. 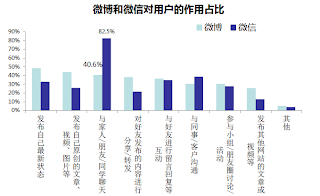 A data research company "DRATIO" published a research report of social media in China. This report is written about the comparison of Sina Weibo and WeChat user, and there are some interesting trend. 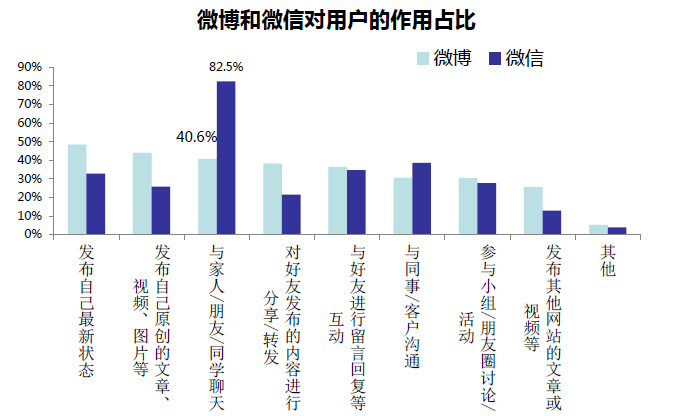 So I will explain the summary of this report. 1. Do you use Weibo or WeChat or both? The over half of users use both services, but there is an interesting trend by the below picture that was categorized by age. Only using Weibo users has turned out that the older ages have the higher rate, but I think that old users maybe use QQ as a communication tool instead of WeChat. 2. In the recent one month, how often did you use each service? 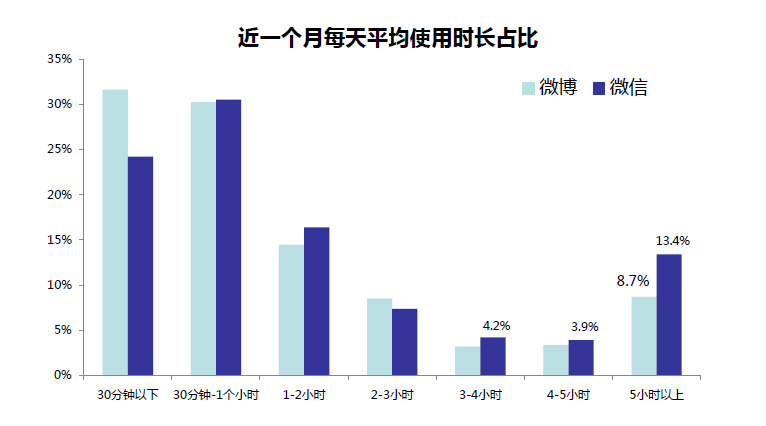 The highest utilization rate of WeChat is over 4 times in a day, and the highest utilization rate of Weibo is 3 to 4 times in a week. 3. How many hours do you averagely use each service in a day? 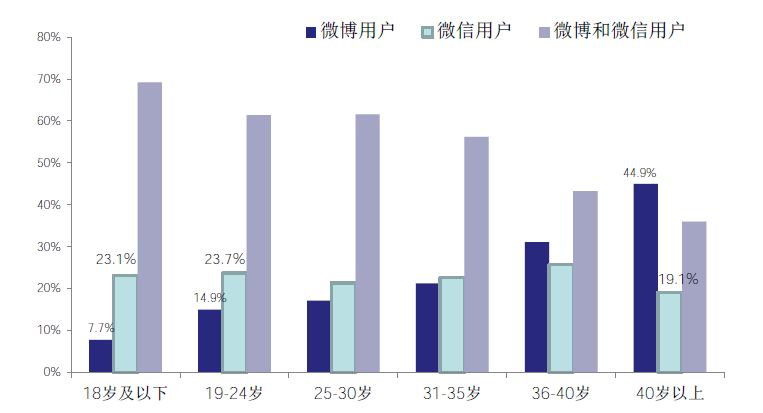 Less than 30 minutes is the highest rate of Weibo user's using hours, and 30 to 60 minutes is the highest rate of WeChat user's using hours. 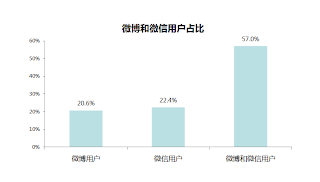 The users who are using WeChat more than 4 hours exist 13.4%, so it seems that the using time of WeChat is relatively longer than using Weibo. 4. Which devices do you usually use for each service? Mobile access is the most popular method of usage of both services, but this is a natural thing. 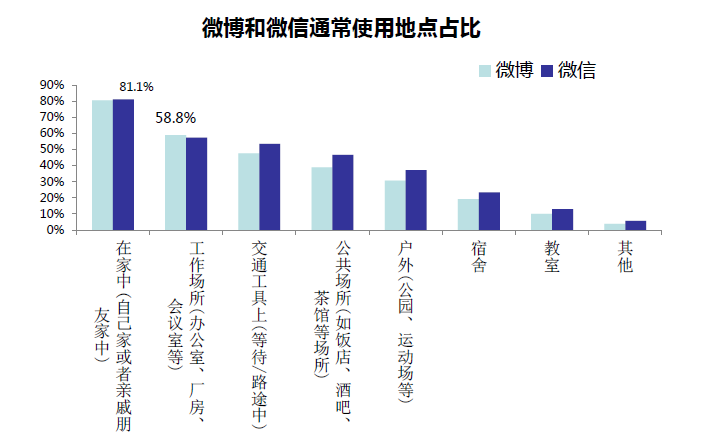 Because as I explained before, mobile device already became the top of all method connecting to the internet in China. Furthermore, Tencent defines WeChat as a mobile communication tool, and Sina said that their more than 60% users have used mobile devices to access Sina Weibo. 5. Where do you usually use each service? As a result, more than 80% users have used each service at home. And it is a characteristic thing that using each service 'at office' is more than 'at transportation facilities'. 6. Which feature do you usually use on each service? 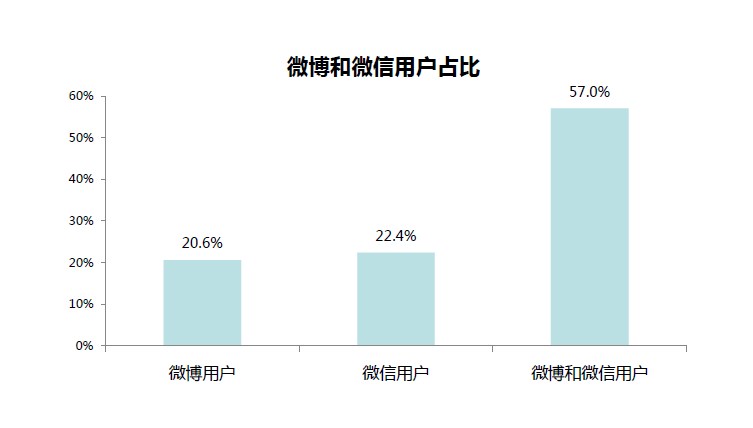 Though it's a natural thing, 82.5% of WeChat users usually use chat feature on it. And the characteristic thing is that very few users use the social feature of WeChat compared to Weibo. I think this is one of the most important fact when we would like to utilize each service for our business. 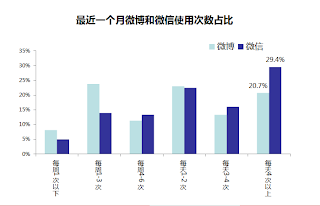 For capturing Chinese social media market, it is a very important thing that compares Weibo and WeChat, and understanding deeply each property. So I would like to continue introducing that point of view in future too. Mobile collaboration makes your business more productive! Free version is also available now! Let's enjoy Chinese Weibo in English! 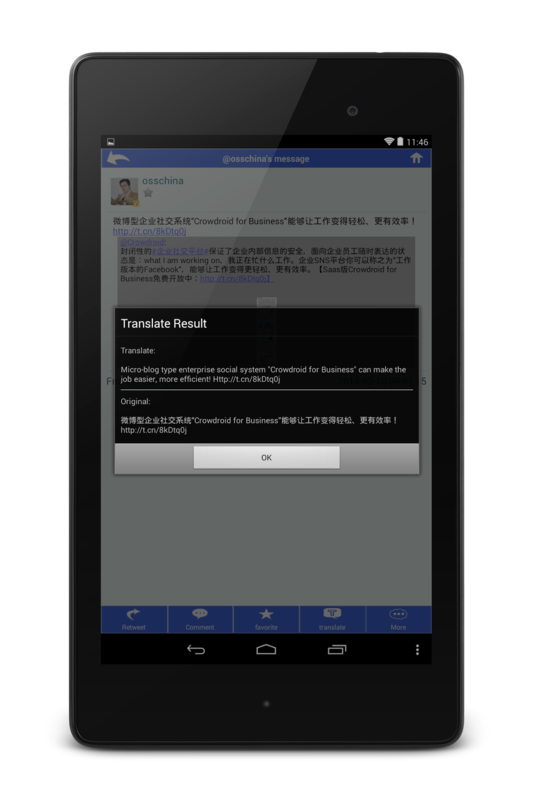 Android + Crowdroid makes your Chinese Weibo life more easy! How to use the Web browser version of WeChat. Let's start marketing on WeChat(Weixin)! Guidance of managing official account on WeChat. 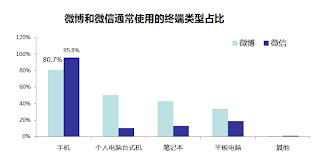 Three reason that enterprise social networking will be welcomed in China. Sogou started to provide the WeChat search service. It supports the account name search and the keyword search. 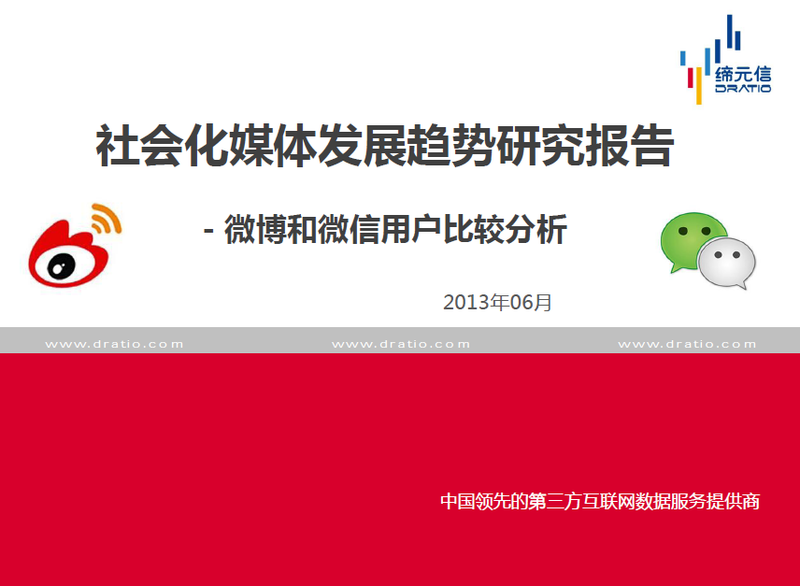 The registered users of Tencent Weibo was 540 million people as of the end of 2012. WeChat strengthened the regulation of the marketing activities for the official account, and also published the regulations of the penalty. Top follower ranking in Sina Weibo and Tencent Weibo (as of 06/10/2012). 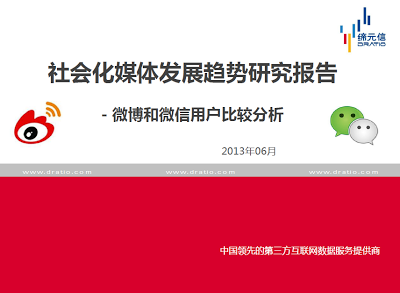 Sina Weibo enter into the mobile payment market. Do they have a chance of success? The popularization map of WeChat : India, Thailand and Malaysia are the 2nd countries next to China.